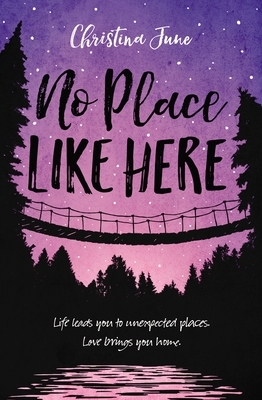 From Christina June, author of It Started with Goodbye and Everywhere You Want to Be, comes No Place Like Here, a modern twist on Hansel and Gretel. Ashlyn Zanotti has big plans for the summer. She's just spent a year at boarding school and can't wait to get home. But when Ashlyn's father is arrested for tax evasion and her mother enters a rehab facility for "exhaustion," her life is turned upside down. The cherry on top? Ashlyn's father sends her to work with a cousin she doesn't even know at a rustic team-building retreat center in the middle of nowhere. A self-proclaimed "indoor girl," not even Ash's habit of leaving breadcrumb quotes--inspirational sayings she scribbles everywhere--can help her cope. With a dangerously careless camp manager doling out grunt work, an overbearing father trying to control her even from prison, and more than a little boy drama to struggle with, the summer is full of challenges. And Ashlyn must make the toughest decision of her life: keep quiet and follow her dad's marching orders, or find the courage to finally stand up to her father to have any hope of finding her way back home.